Just as there are different types of leaders, there are also different types of followers. A visual representation of these is shown below, along with a brief description of each. Most leaders love their stars - those who take initiative and do what needs to be done without being told. But the true test of leadership lies in developing direct reports who need more guidance and hands on supervision. Gaining a better understanding of those you lead can help you be a more effective leader. 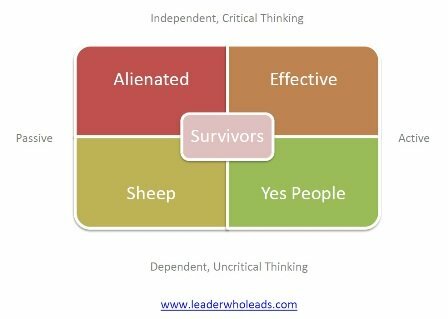 Although the alienated follower is independent and thinks critically, they are passive. Their passivity distances them from the leader and their team members. Because they are passive, they do not use their strengths to help the team achieve its goals. They have something of valude to offer but choose not to do so. Of the five types, this type of follower tends to be the most disruptive. They may offer passive resistance when they do not agree with a decision or course of direction, but often will not offer their input. When dealing with this type of follower, I recommend that you ask for their input. In doing so, the leader conveys that they value the person and what s/he has to say. Sheep are passive AND dependent. As such, they do not think critically and tend to do as they are told, rarely putting forth an opposing opinion. They leave the thinking to their leader. These attributes serve neither them nor their fellow teammates. Because they require constant supervision and prodding, this type of follower negatively affects team dynamics and performance. As the leader, addressing this behavior head on in a positive way could turn things around. This may be the perfect time to give some performance feedback . Yes People are active, but they are dependent AND do not think critically. Because they are conformist, they will agree with the leader without question. Their major concern is avoiding conflict. As such, these types of followers pose a danger to the leader and themselves due to their unwillingness and inability to put forth challenging viewpoints, which could produce a better outcome. Survivors are chameleonic. They go with the flow, following the path of least resistance. They are most interested in playing it safe rather than taking a risk. Their greatest fear? The fear of making a mistake. Proactive, independent and able to think critically, effective followers are also respectful of the leader’s authority. Effective followers are life-long learners. They practice self-leadership, take responsibility, are committed and seek feedback to continuously improve their performance. Also known as “dynamic followers” they are very valuable to leaders and the team. Because of their consistent and high quality contributions, this type of follower is often a trusted advisor to leaders who lead. So, what kind of follower are you? Assess yourself and ask for feedback from your leader. This might be a great opportunity to become a more effective follower. It might also be beneficial to determine how the five Types of Followers might interact with various Leadership Styles.